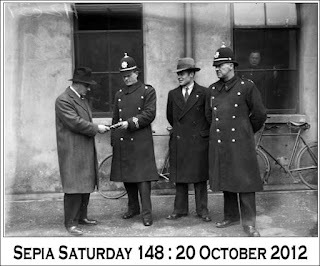 For the past few weeks, I’ve mostly used images from my family albums when I participate in Sepia Saturday. For this week’s image prompt, I thought I'd choose a picture from my husband’s photo albums that closely resembles the above picture. However, this decision caused me a bit of a dilemma, because there’s not one single solitary image of ‘police’ or ‘guns’ or such like in their albums. Not to worry, I thought, just go with another choice, like uniforms, well-dressed men, bicycles, windows, people peering from the shadows, buildings, or something completely different. It was then that I remembered a certain black-and-white photo. Michael and his sister Margaret, about 1962. 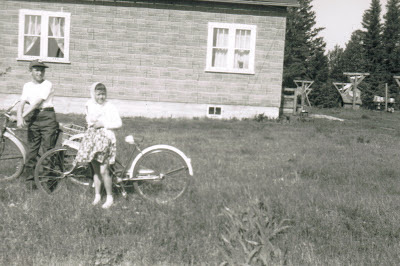 My future husband Michael (in his pre-eyeglasses days) and his younger sister Margaret were photographed with their bicycles by their farm house near Pelly, Saskatchewan, Canada. Hubby thinks it was about 1962 or 1963. He’s dressed like most typical boys of those days, complete with baseball cap, but his sister’s dress doesn’t seem too convenient for bike riding, does it? (As a girl, I wore shorts and tops in the summer; dresses were reserved for special occasions like birthdays.) When I visited Maggie last month, I asked her if she remembered this photo. She did, and then explained that, as a young Doukhobor girl, she regularly wore dresses or blouses and skirts and a kerchief or head shawl. Maggie added that she didn’t own a pair of pants until she was a teenager. Regardless of how they dressed, I’m sure that Michael and Margaret had lots of fun riding their bicycles during their carefree childhood summers! 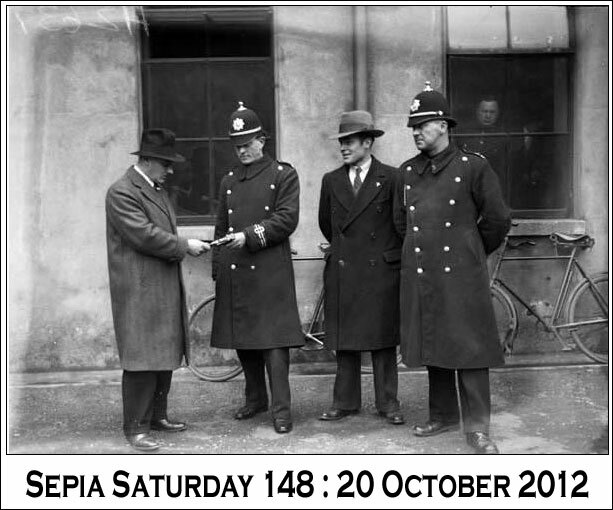 If you want to see how other bloggers “[use] old images as prompts for new reflections”, head over to Sepia Saturday. Copyright © 2012, Yvonne Demoskoff. I like this photo. Your interview with Margaret produced some interesting information about your husband's childhood. Thanks, Wendy. Speaking to my sister-in-law was certainly helpful! Two windows and two bikes, spot on theme. I don't think I have any family photos ahowing bikes other that my daughter with a trike. The boys got off easy with the trousers and caps; girls must have had a heck of a time trying to play in skirts in windy Saskatchewan! I used to hate trying to keep a skirt from blowing up when I was a kid. I much preferred pants. Whatever they wore, there was a lot of laundry being done. So many clothes lines in the back ground. I never played in dresses, but I had to wear them to school. So I had to wear a dress when I rode my bike to school. Yes skirts of that volume are very impractical for bikes its blowing around even standing still. Imagine going down hill in it. What a great photo, her bike looks so big next to her, and yes it was in the day that girls and women pretty much always wore dresses, and hats and white gloves even! I bet Michael's father behind the window ducked in time, just before the picture was taken. I looked carefully at the photo before I posted it, Peter, just to make sure there weren't any lurkers in the windows, but I didn't find 'hidden' people, lol. Sweet photo of your husband and his sister. Thanks, Jana! It is a nice photo. Your sister-in-law's dress reminded me that my mother also had to wear dresses during the school week; pants were reserved for the weekend. This was in the 1950s. You are smart to ask about the photo. I also ask my family about the story behind certain images and then record their answers. One of the things I like about participating in Sepia Saturday, Bee, is that I'm now taking a closer look at my photos and seeing if there's anything else I can learn about them by asking family members for their input. Well I've learned something new, which is always good. I had to look up Doukhobor as I'd never heard of it before. Now I want to know why! Fascinating. Thank you. Glad to hear you learned something from my article, Nell. Doukhobors are pacifists and, at one time, lived communal and rural lives. In many respects, they ressemble Mennonites and Hutterites.